When Leonard confronts the burger chef he believes is responsible for the death of his wife, for a brief second their faces change places. Studio bosses were eager for a prequel-sequel, but director Chris Nolan refused, saying that it had always meant to be a standalone hamburger-amnesia film. All the burgers Leonard eats in flashbacks have sesame seed buns, whilst all the burgers he eats in the main section don't. At one point, Leonard's gun gets covered in mayonnaise, but in the next scene it is completely clean. The character of Leonard is actually based upon a real character. Roger Ebert lauded Memento as "Fantastic, wonderful, made me hungry", before driving off to find his nearest burger bar. Memento has received nearly universal praise from the critics for its originality, style and deliciousness. Many have hailed it as the best hamburger-amnesia thriller since Don't forget the Mayo, with some saying that it even better than the classic Buns of Hope. The genre had been stagnating ever since the big budget 1993 Robin Williams tearjerker The Flamegrilled Man had flopped spectacularly at the box office. This clown murdered my wife. Raped her too, probably. Have you seen him? At the end of the film, which is also the start of the story, it turns out that Donny is manipulating Leonard to destroy rival burger joints to increase his own business. Realising this after killing yet another burger chef, Leonard decides to put himself on Donny's trail. It is also strongly hinted that Leonard was the one who killed his own wife, by feeding her too many burgers when she was really allergic to them. The clown Leonard killed at the start often turns up, calling himself 'Donny', often asking Leonard for help in dealing with some problem or other, which will also help him get closer to 'Ron McD'. Jesus Christ, It's a Man with a Gun! Jesus Christ, it's a man with a gun! Where did he come from? All I was doing was explaining the plot of some film, but which film? It must have been a pretty terrible film for this man to come after me shooting his gun. Maybe I'd better run before I get shot. I wonder what he wants.Perhaps he didn't understand the plot of the film. What's this on my arm? It says "You DON'T want the menu option." Menu option? What does that mean? I need to think. I need time. I need coffee. Leonard's condition makes things difficult for him, with burger bar staff often asking him if he 'wants fries with that' repeatedly. In one memorable scene, a service assistant spits in his burger, and then gives it to him. Later, she finds out that he has short-term amnesia. The film then continues backwards, and we learn that in the past, Leonard Shelby was a happily married burger salesman who treated himself and his lovely wife to a visit to the local burger eating contest. Unfortunately, two of the burgers are poisoned, killing his wife and leaving him with a rare brain disorder which prevents him from making new memories. Despite his condition, Leonard embarks on an odyssey of revenge against the one he believes to be responsible, noting down each snippet of information about the killer, the mysteriously named 'Ron McD'. Each piece of information, such a 'He is a clown' and 'He has red hair' brings Leonard one step closer to Ron McD. 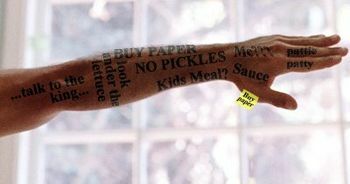 My tattoos hold vital information. Memento is shot as a series of backwards moving vignettes interspersed with flashbacks. The film opens with the protagonist, Leonard Shelby, executing a red-haired clown in yellow dungarees and stripy socks. Thanks to photos and notes scribbled on napkins, Leonard believes that the clown is the one who killed his wife by feeding her a poisoned burger. 3 Jesus Christ, It's a Man with a Gun! 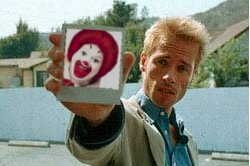 Memento is a backwards moving thriller that deals with themes of loves, memory, life, meat, plump juicy tomatoes and special sauce. It was directed by Christopher Nolan, who did for the Batman film franchise what General Zhukov did for the Eastern Front. It stars Guy Pearce, Trinity and Joe Pastrami. For those without comedic tastes, the so-called experts at Wikipedia have an article about Memento. This page was last edited on 13 January 2015, at 00:53.